The best ground engaging tools are only as good as the hardware securing them. Always choose VBL™ Nuts & Bolts, Pins / Retainers. 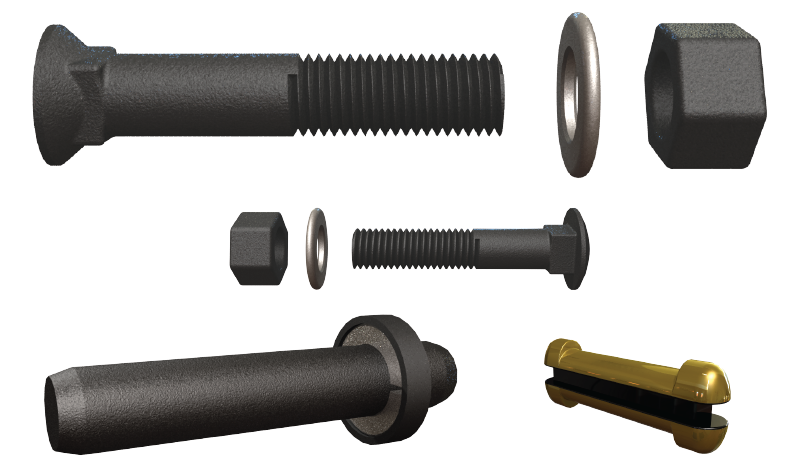 VBL™ domed-head plow bolts, carriage bolts, hex bolts and socket head cap screws are available in a wide array of sizes and lengths as well as several different grades. Metric and imperial sizes, lengths, threads and grades are available to suit every application. Several styles of standard and locking nuts and washers are offered to ensure the right combination of hardware for the job. VBL™ pins and retainers are manufactured to OEM specifications. Several different configurations including “flex-pins”, “side-pins” and many others are on hand to suit all types of G.E.T. VBL heat-treated parts are warranted against breakage throughout the useable life of the part.